The “Ormond Knight” has been dead for over 600 years. A primitive carved effigy of him adorns one of the pillars in the cloister at Jerpoint, a Cistercian abbey established in 1180 and dissolved by Henry VIII in 1540. Ever since I first saw this carving twenty years ago, I’ve been drawn to it. The knight’s puzzled expression, obscured by an oversized helmet, and his ill-proportioned body gained my sympathy and my interest, as did the tiny monkey carved awkwardly in the stone to his right. Thought to be a symbol of the Butler family, dukes of Ormond, the odd little figure was clearly designed by someone who had never seen a monkey before. I’ve taken hundreds of pictures of the Ormond Knight, I visit him as often as I can, and I even have a fake stone copy of him hanging on my office wall at home. I’ve already written about him in this blog (“10 In our arts we find our bliss”), because he is often on my mind. What can I say? He’s a friend. All over Ireland there are women and men—many of them only represented by their heads—along with animals and imaginary creatures whom I visit on a regular basis. I love returning to the abbey, church, or castle where these medieval characters reside knowing I’ll see familiar faces. Greeting them each time is very reassuring, for their expressions never change. Like true friends, they are always what they were the last time I saw them. These stone beings reach across the gulf of centuries with their artistry, their individuality, and their humanity. 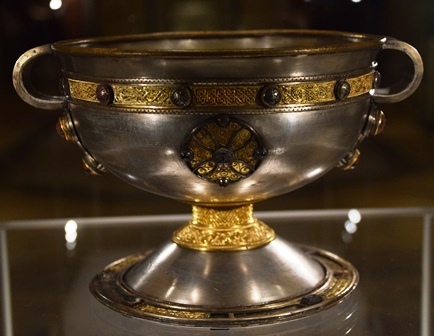 The Ardagh Chalice, 8th c.
If you’ve visited the great cathedrals and churches of Europe—Chartres, Cologne, St. Basil’s, Notre Dame, Salisbury, Florence…the list goes one—Irish cathedrals and churches will seem smaller, less ambitious, even amateurish by comparison. With the exception of St. Patrick’s in Dublin, they are not built on a grand scale, and the surviving stonework is much less elaborate, seemingly primitive in conception and execution. 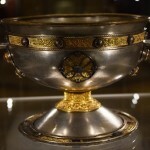 The Golden Age of Irish religious art in the seventh and eighth centuries CE preceded the building of the great churches: the famous illuminated manuscripts such as the Book of Kells and artifacts such as the Ardagh Chalice, the Bell of St. Patrick, and others of this period represent a pinnacle of achievement. But once Irish monks had re-Christianized Europe, the center of ecclesiastical art and innovation shifted to the continent. The little island in the northwest corner of the known world would continue to have a rich religious history, but the wealth and cultural exchanges possible on the trade routes of Europe left Ireland in the dust. Irish church art and architecture have their own unique appeal, though, and if you set your sites to appreciate the quirky, the original, and the personal, you will not be disappointed. 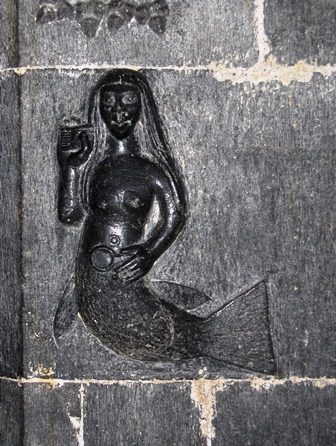 Take the mermaid at St. Brendan’s Cathedral, Clonfert, for example. Carved randomly on a pillar inside the twelfth-century church, she was added in the fifteenth century, probably to commemorate the seafaring life of St. Brendan the Navigator, to whom the church is dedicated. 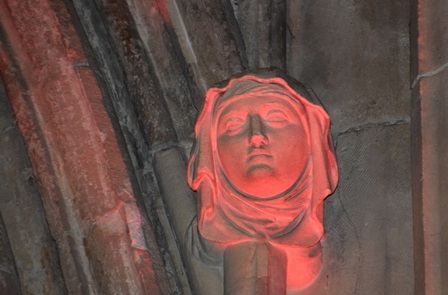 Her enigmatic smile reminds us of how little we know about such figures, their creators, or the reasons for their addition to church decoration. When I bring people to Clonfert, I always wander off at some point to visit her, just to have a moment all by myself. 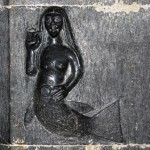 When I see the mermaid I sense a direct connection not only to the artisan who carved her but to the age when the native pagan mythology merged relatively comfortably with the new stories and beliefs brought from the continent. That uniquely Irish merging of the pagan with the Christian underlies part of the appeal of the faces that look out at us across the centuries. 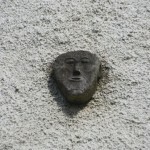 To see the sheela-na-gig, tilt your head to the left; her head touches the wall’s edge in the middle. The mysteries regarding the origins and the creators of carved figures also make them interesting; there’s plenty of room for our own interpretations. Though she doesn’t have a recognizable face, another female figure of likely pagan origin I like to visit is a sheela-na gig on the outer wall of the Rock of Cashel, a fortified ecclesiastical site in County Tipperary. 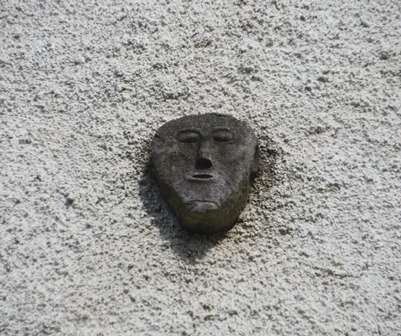 Sheela-na-gigs are usually female in Ireland where 101 of them decorate churches, castles, and other medieval buildings. 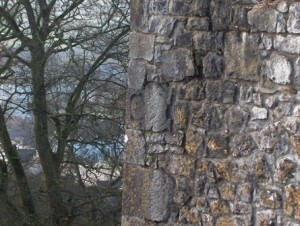 Their odd placement on existing stonework suggests outlaw intentions. Britain has forty-five sheelas, mostly male, and a dew of the strange little figures also appear on the continent. 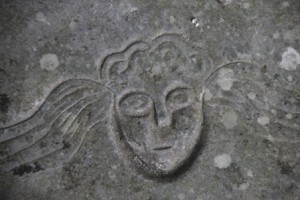 Most of the Irish sheela-na-gigs are quite shocking, depicting crude squatting figures exposing their genitalia. They were clearly not part of the ornamental programs of the buildings on which they appear. Someone put each figure in its special place, probably under cover of darkness, fully cognizant of its shock value and knowing what a powerful impact it would have on all who saw it there. We don’t really know what these figures mean, but many theories address the question of origins: Do they represent a pagan goddess, possibly of fertility? Were they intended to ward off evil spirits with the “hideous” features of the female body? Were the figures designed to warn priests and others of the dangers of lust or of unchecked female sexuality? Are they symbols of a cult or underground religion? So little is known about these figures that even the origins of the name are disputed, though the word “hag” comes up in several theories. Whatever their story, I certainly identify with the rebellious spirit that broke the solemnity of official architecture in this manner. Sometimes it’s just the look on the face of a carved stone figure that draws me in and brings me back for further assignations. St. Patrick’s in Dublin shows more formal design than many of Ireland’s old churches, and rightly so as it is by the far the largest and most grand. I have some favorites here—heads without bodies carved high up, out of human reach, but not too far away for a personal connection. 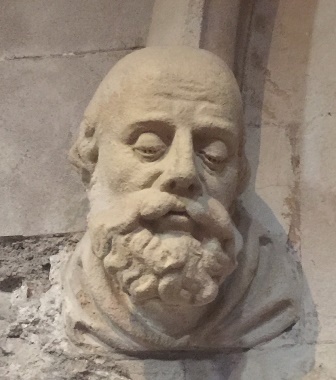 I like to think that long ago, someone sitting through a seemingly endless mass in the frigid cathedral looked up out of boredom to gaze at one of these heads, perhaps making up a story for the person depicted, as I often do. The man pictured here may be a saint or a monk or a cathedral patron, but the look of sadness and resignation on his face speaks of suffering or sorrow or both. Somehow I also detect that he had a sense of humor. What was his story? Did the sculptor turn his father’s face into that of a saint? 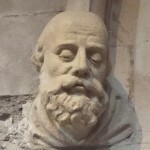 Did a local person pay to have his face immortalized in the cathedral? Is that the sculptor himself looking so grieved? The lady in pink is from Christ Church in Dublin, lit up during a traditional music festival held in the cathedral. Whether wearing her natural gray-white or as part of a light show, she exudes serenity. I sit near her when I want to think. Sometimes these faces looking out from the past are all that’s left of the great religious communities that dominated Irish society before the Vikings introduced the concept of the secular town. The other day Ron and I took it into our heads to track down a high cross we had been meaning to see, the one at Durrow in Count Offaly, which had once been a great center of religious learning and craftsmanship and produced the famous Book of Durrow, an illuminated manuscript similar to the Book of Kells. Founded by St. Columcille in the sixth century, Durrow was only recently acquired and protected by the state. The church standing on the site is mostly eighteenth century, but for those willing to look in odd places for remnants of a far-off past, a tiny medieval head high above the main doorway on the outside of the building is a fine reward. More mask-like than human, this head may be a saint or a patron; its spare, enigmatic features offer much latitude for interpretation. Was it always in that position or did some careful builder rescue it from a rubble heap and secure it in this place of honor? This head along with a couple of Early Christian grave slabs, the ninth century high cross, and some very ancient trees nearby make Durrow a portal to the medieval world. Now that I know where he (or she) hangs out, I’ll be back to check in with this mysterious new friend. Though faces are the most compelling, sometimes other body parts seem to tell a story. One hand and both feet of a recent acquaintance, the Kilfane Knight, are depicted with such delicacy and care that you are persuaded the artist gazed at the body as he carved, as indeed he may have done. This fourteenth-century effigy, also known as the Long Man or the Cantwell Fada—“fada” means long in Irish—is the tallest such figure in existence and is believed to represent Thomas de Cantwell, a Norman knight and Lord of Kilfane. 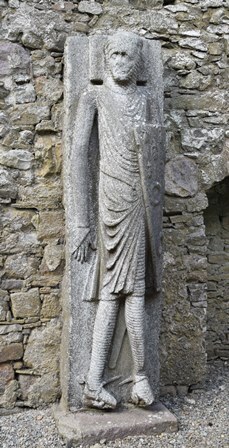 Standing against the wall of the nave in the Kilfane Church in a very remote wooded area near Thomastown, Co. Kilkenny, he appears in his full height, the nobility of his bearing softened by the very human hand with fingers extended and the uncertain placement of the feet. Theories about the meaning of body position come and go: one older argument claimed that crossed legs meant the knight had been to the crusades, but that has been challenged. Those awkwardly placed feet may have symbolic meaning or may result from the artist’s attempts to create perspective or to portray injured limbs realistically. Either way, these oddities give us a sense of the Long Man and of the stonecarver who paid him this last act of respect. I particularly love the random figures thought to be the personal marks or messages of the artisans employed in building the churches and monasteries. Sligo Abbey has several of these: a love knot in an arch in the cloister, a ram’s head all by itself on another part of the colonnade, and a lovely winged angel head, who looks very twentieth century with her big eyes, curly locks, and pert gaze. Holy Cross Abbey in County Tipperary is famous for such whimsical additions. The longer you linger within its heavy twelfth-century walls, the more of them you see in odd corners, shadowed surfaces, or high up where only the light of day brings them to life. I spotted fleurs-de-lis, infinity symbols, leaves and flowers, and what can only be called squiggles on columns, capitals, and walls all around the church. My favorite is this noble owl, far more realistic than my poor photograph shows, high up on a column, wings spread, looking down at its prey—or at the congregation. 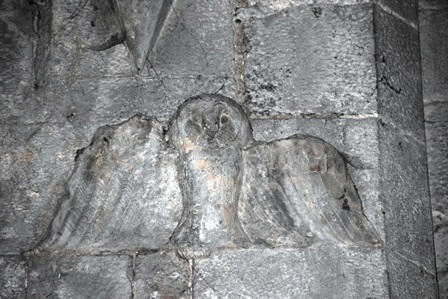 The artist certainly knew his birds, but whether he carved the owl purely to make his personal mark or to signal some particular meaning is anyone’s guess. The owl is not human, but his lifelike form speaks for the human who made him. I’d like to write a children’s book about this owl and imagine a story that led to his enshrinement in a church. Even the battered, time-worn faces—like those in the photograph below from inside of Cormac’s Chapel at the Rock of Cashel—still seem to look at you intently from the distant past, yearning to tell their stories, letting you know that they lived, and loved, and suffered, and died. The carved stone heads on the ceiling of this rare, intact twelfth-century structure are surrounded by the remnants of precious frescoes recently uncovered when centuries of paint and mold were carefully removed—beautiful, we can still imagine, but barely decipherable now thanks to weather and neglect. 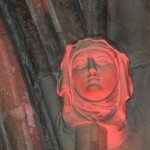 By contrast, the stone faces are startlingly individual and real. Even in medieval times, the builders and artists who created the churches must have understood that their most durable legacy would be that which was made of stone. Each time I come back to visit one of my medieval stoner friends, I am reminded that my connection with them across the centuries is no accident. i rather like this post! You are certainly posing all the right questions to medieval sculpture —clearly it resonates with you! Fondly, your local medievalist! Loved this article! There are so many artifacts across Ireland to ponder the history and significance of, they seem endless. Looking forward to the day I can visit again for another chance to appreciate them in person.